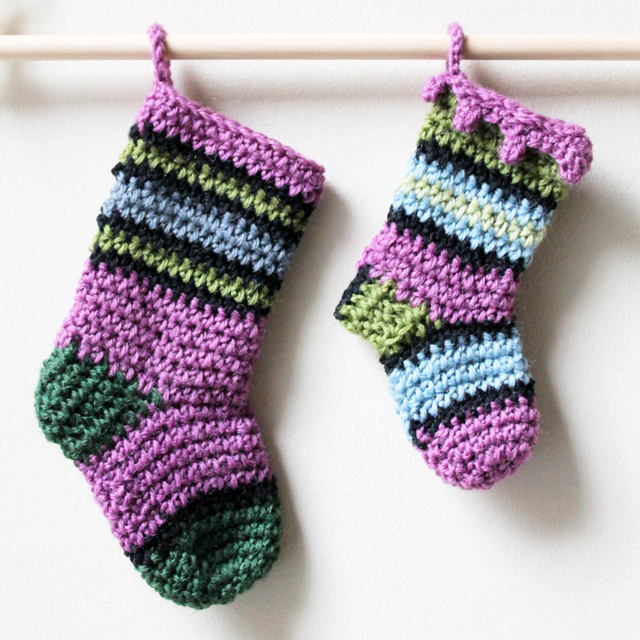 I was so enchanted by the cuteness of the crocheted mini stockings, over on the blog "Le Monde de Sucrette", that I just had to try out Sucrette's Free Pattern. 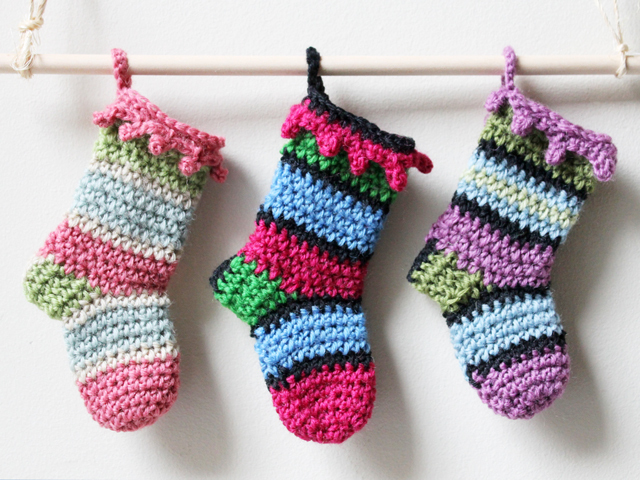 These tiny adorable creations use up hardly any yarn at all and are easy to make. So, with my stash of vintage tapestry wool by my side, and Netflix on tv, I just kept right on going, eventually making four of them in one sitting. 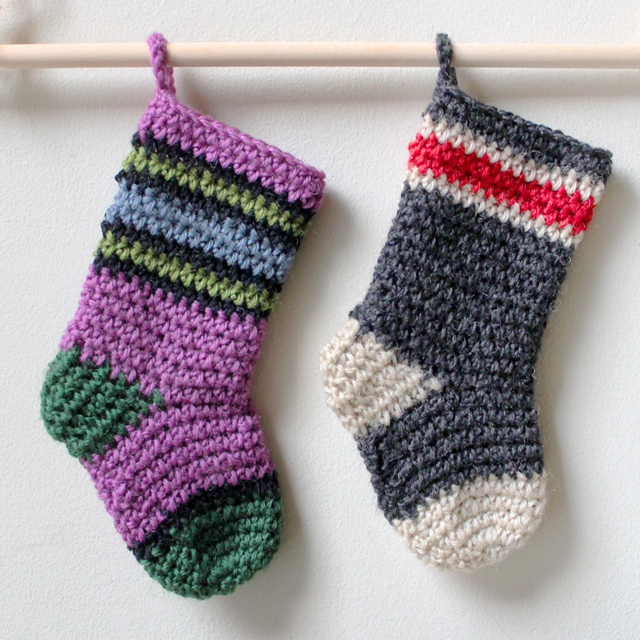 My friend Julie is a knitter, and last year she made 24 tiny stockings which she used as an advent calendar for her children. See what she did in her post here. 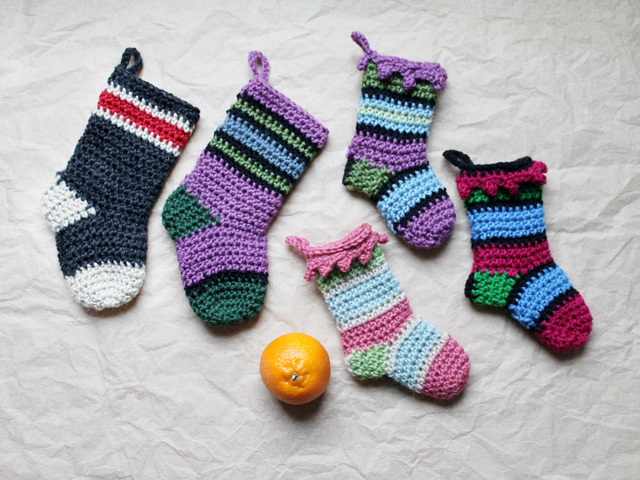 Sucrette's pattern could be used by crocheters to do the same thing. Slight modifications that I made : By the final two, I decided I preferred the look of a slightly shorter toe, so eliminated one row in the foot part (the toe part specifically, if you use the same colour changes I've used). Make a 24 stitch chain and close it to form a loop. Chain-2, half-double into next 2 chain stiches. To make the first pompom "ball", chain 3, create two half-double stitches into second chain from hook (forming the "ball" of the pompom). Slip stitch into last of your 3 chains and then back into the chain stitch you were in before you began the "ball". Half-double into next 3 chains, and repeat with chain-3, 2 half-doubles, 2 slip stitches. Repeat all around loop, forming 8 "balls" in total. 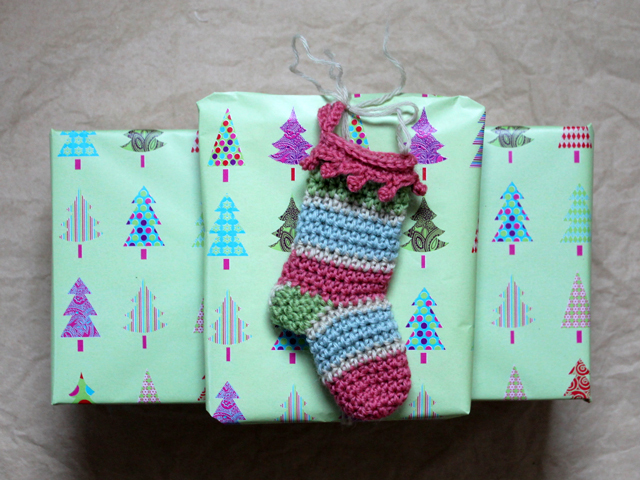 Attach the trip piece to the stocking by half-double crocheting through both thicknesses, all around. Finish with a loop for hanging, created by chain 14. Turn and go back down chain, slip-stitching into each chain. Leave about 6 inches, cut yarn and bind-off. Using a darning-needle, stitch the loop shut. Discovering I needed a bigger (but still small and cute) stocking : I tried sticking some concert tickets that I got for Nick into one and found that they were just a tad too small to be used to present those. 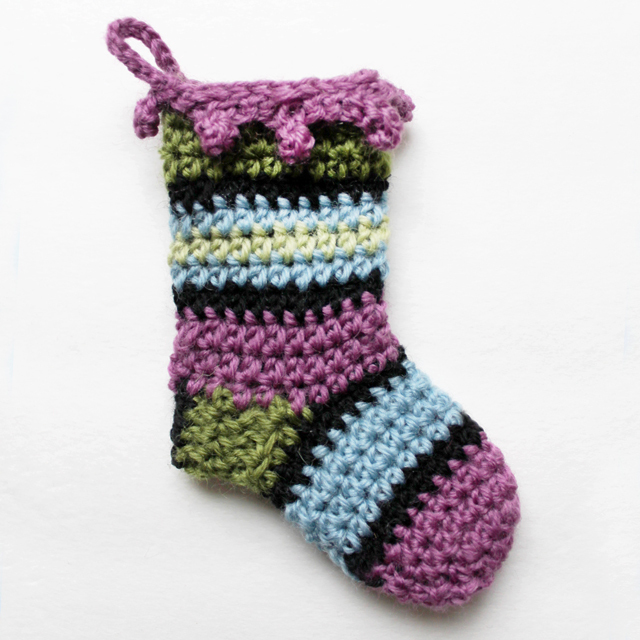 So I've modified Sucrette's pattern, making a stocking that's a bit bigger. These ones are 7 3/4 inch from top to toe and 3 inches wide. 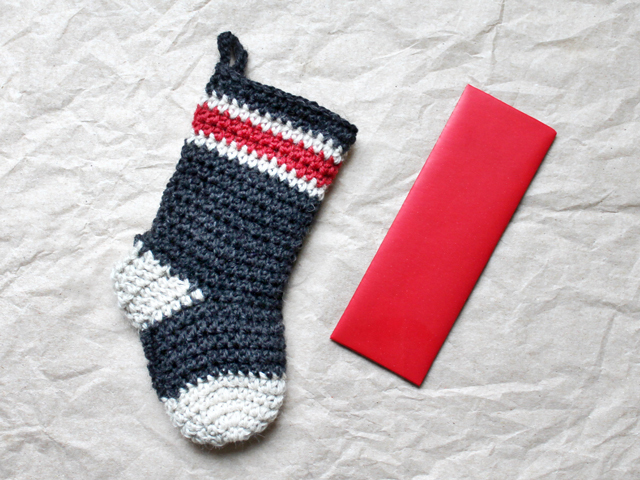 This size could be used to enclose slightly larger things, such as gift-cards, which don't fit in the tiny ones. 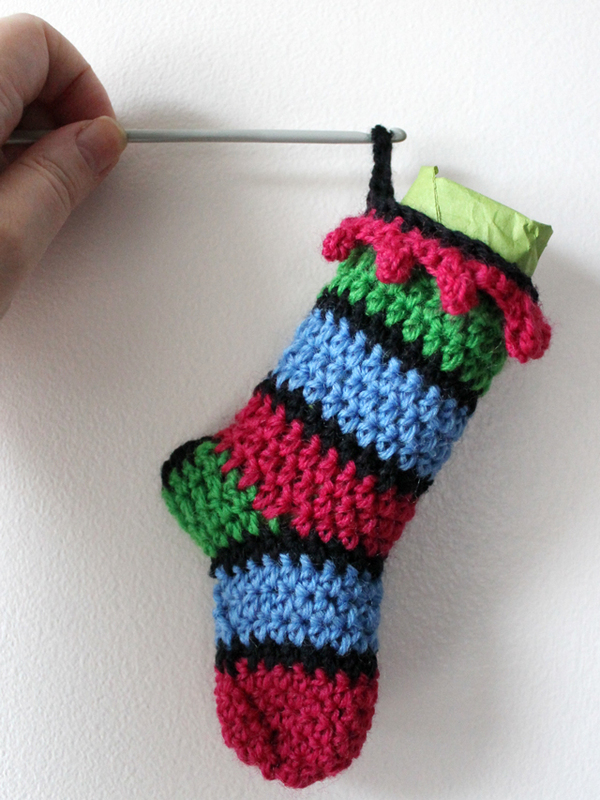 Here is how you change Sucrette's pattern to make a bigger stocking. Note: you'll want to pop over to her site to read her instructions, as she had created a good tutorial, including a number of very helpful pictures. - Begin with chain 4, made into a ring. Chain 2. - Half-double crochet stitch into the ring 12 times (your first ch 2 acts as a 13th.) Slip stitch into the top of the beginning chain-2, to close the ring. Chain-2. - 2 Half-doubles into each gap between stitches, for a total of 26, including the beginning Chain-2. - Repeat rows of 26 stitches (25 plus chain-2 = 26) for 11 rows. This creates the foot part. Colour change after 5 rows if you want a different coloured toe part. As for colour changing, I cut the yarn and bound-off between each colour, although you can just change colours and carry the other colour along until you want to use it again. - To make the heel, chain-2 and stitch 13 half-doubles onto your tow part, with 7 on either side of the back "seam" resulting from the "ch-2, slip stitch to close ring" thing. 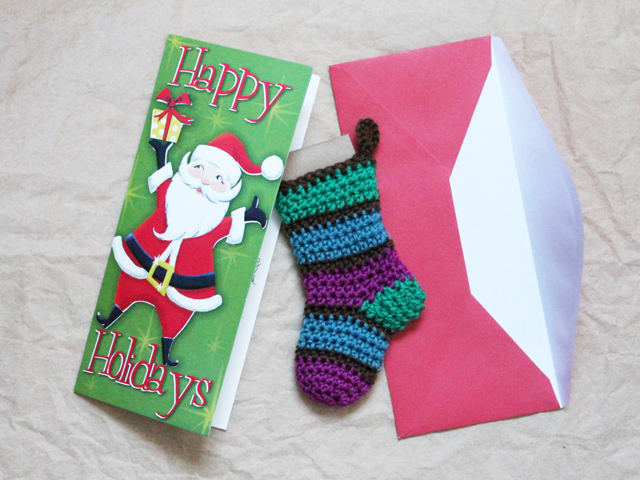 - Cut yarn and bind-off. 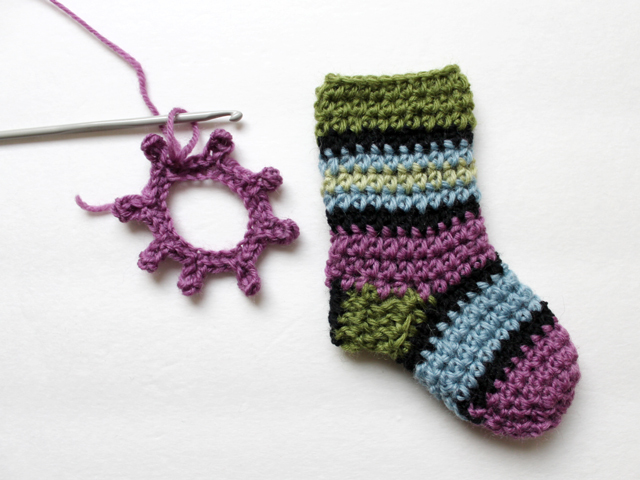 - If you want the heel to be a different colour, change yarn. Chain-2 and turn work and go back, making 13 half-doubles into previous row. Repeat until you have 6 rows. Leave yourself a tail of about 6 inches and cut and bind-off. - Using the tail, "sew" down the back of the heel, by whip-stitching. 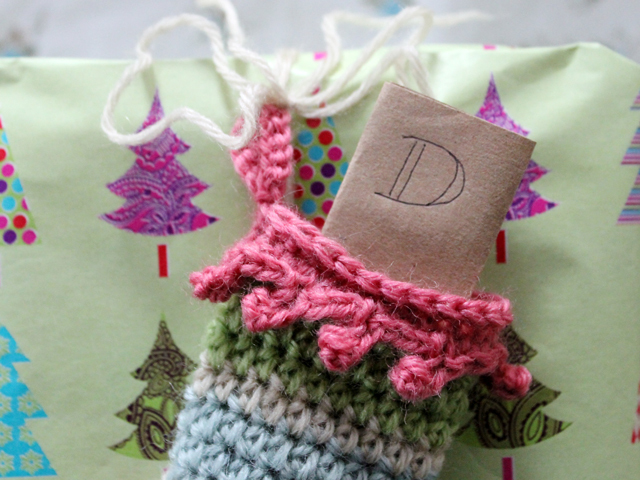 I just use my crochet hook to do this, however you can attach a darning needle if you prefer. Try to round it at the bottom. - Now you're ready to begin the leg part. Chain-2 and make 27 half-double stitches, spacing evenly around toe and heel part (see Sucrette's instructions here if that isn't clear), for a total of 28 including beginning chain-2. - Repeat rows of "Chain-2, 27 half-doubles, close row by slip stitching in to beginning chain-2" 14 more times. - To create loop for hanging, chain 14. Turn and go back down chain, slip-stitching into each chain. Leave about 6 inches, cut yarn and bind-off. Using a darning-needle, stitch the loop shut. I hope these instructions are clear. Again, referring to Sucrette's original pattern and photographs will help. Thanks very much for reading. 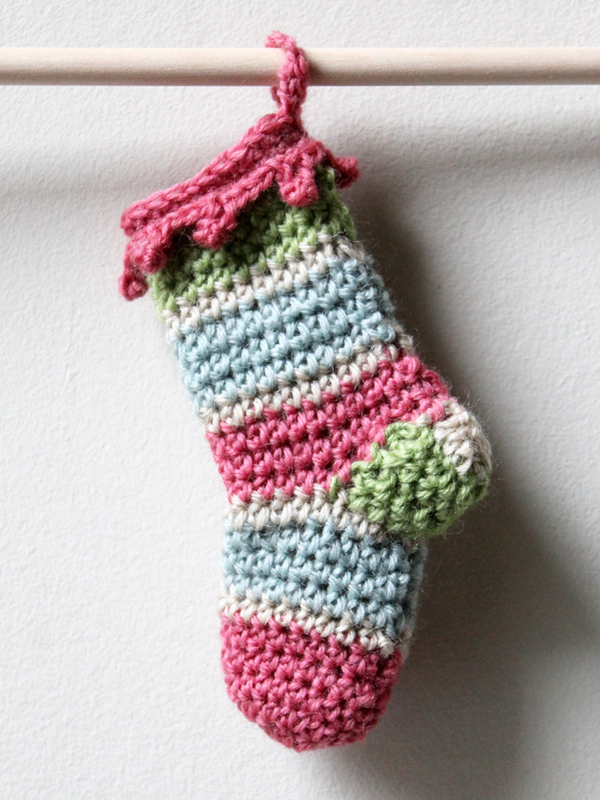 I hope the crocheters out there will try either Sucrette's Mini Stockings, or my Small Stocking Modification. Darling little stockings! So perfect. Hi Hollie :) Thank you! 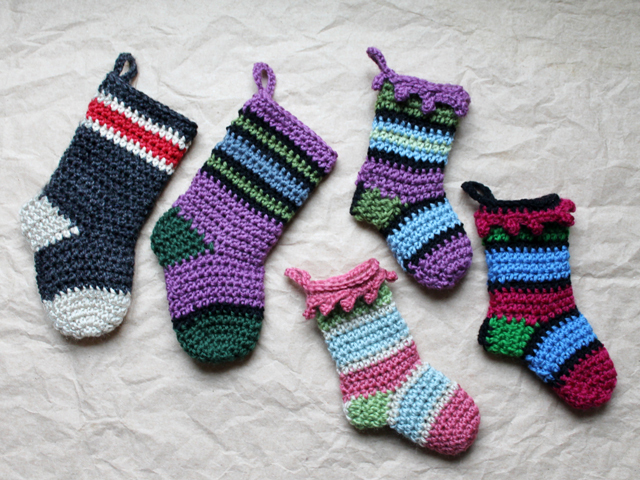 those are so awesome, I love your crocheted version! They look perfect. Thanks, Julie. I was definitely motivated by the excellent ones you knitted last year!